Carol J. Larson - Author and Artist: Author's Notes: Caution - hot! In one of the first scenes in Big Stone Heart, our heroine, Carrie Smith, is making potato soup . We smell the pungent odor of bacon and and onions sizzling away on the iron cookstove, hear the plunk of potatoes as they are thrown in the water to boil and the soft simmer of the finished soup. A simple dish, you might think. 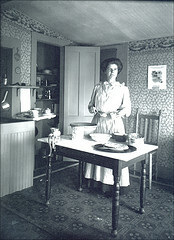 True - in terms of a few basic ingredients - but making a meal in 1886 was anything but simple. Take the iron cookstove, the heart of any kitchen. In 1886, when gas stoves were still rare, the cookstove was heated by wood, coal or kerosene. What this meant was that the wood had to be readily available and nearby, cut into the correct length for the stove, lighted, stoked and kept going long enough to finish the meal. There were no true thermostats so getting to and maintaining the correct temperature was a highly refined skill. In urban areas, coal and kerosene could be had fairly easily. In rural areas, far from the nearest town, getting coal or kerosene could be a challenge. My husband tells the story of his great grandparents and others in rural South Dakota who would wait by the tracks for the steam trains to pass by. Lumps of coal would fall from the train while they were being shoveled into the great engine by the fireman. The people waited until the train passed, then scrambled to collect the coal to take home for the hungry maw of the cookstove.